* I never saw Iron Man 2 as it came out during the middle of my One More Day inspired boycott of all things Marvel, before I decided it was more effective if I limited it to all things Spider-Man. And then I just never got around to it. * I had heard that Iron Man 2 wasn't a good movie on its' own terms and that it seemed to exist only as a starting point for setting up other Marvel films. Iron Man 3 suffers no such problems. 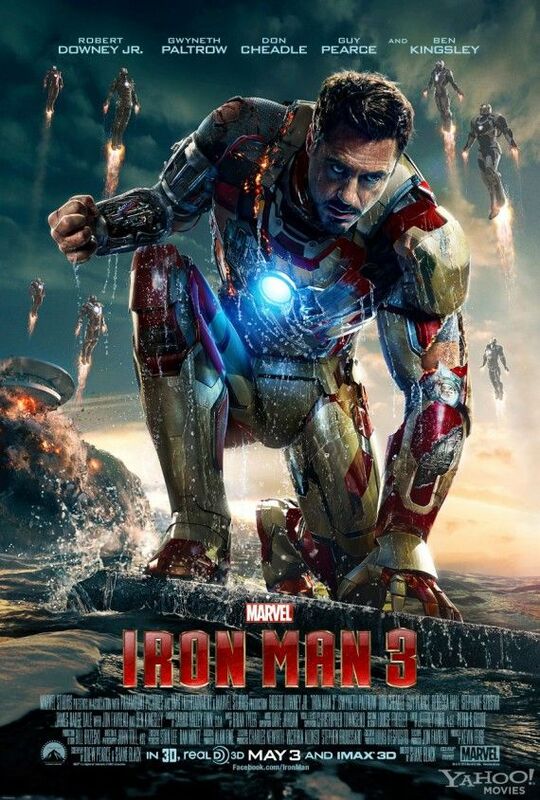 You can come into this one having never seen any of the other Iron Man movies and still follow the plot. There are some things that don't get explained (i.e. Why the US Government has an Iron Man suit in the form of Iron Patriot when Tony is so otherwise protective of his technology) but the relationships are laid bare early on. * There was a trailer for a Vince Vaugh/Owen Wilson comedy that came one word away from referencing a famous Kitty Pryde line. I can't help but wonder if that trailer was intentionally designed to air before this movie. Probably. * Stick around until the end of the credits. There's a little more to see. This should go without saying with all the Marvel movies at this point but there it is. Stay until the very end! * Did I like the movie? Yes. I recommend it highly. Everything after this - while technically spoiler free - does talk about some details of the movie, so stop reading my review here if you want to go in totally virgin pure. * The storyline is basically taken from Warren Ellis' Extremis arc - techno babble being used to justify hacking the human body to enhance it. Shocked they didn't use the word "mutation" since basically that's what they do, save that there's no variation in what the altered can do.. Maybe Fox still owns the rights to the word along with the X-Men characters? * There's been some concern with the various previews being released on-line that there will be nothing left in this movie to surprise us. That's far from true, though I do think the best action sequence in the whole movie did get spoiled by the first preview even if we don't get to see the end of it. * Pepper Potts does play a role in the action. It may not be the role you'd expect or indeed the one that's been teased. Suffice it to say, she's far from a damsel in distress and does facilitate more than one rescue. * Another concern - the possible racism of a British actor of Indian heritage playing a Chinese super-villain run through a filter to be vaguely Middle-Eastern. Trust me: all is explained and Ben Kingsley is brilliant. * Nice use of AIM as the background minions for the main plot. * While Don Cheadle isn't a bad actor, I still find Terrence Howard to be the better Rhodey. * One minor plot hole - where the hell is SHIELD in all of this? There's a token mention of Tony hacking their databases at one point for information on The Mandarin but shouldn't we have seen some blue uniforms on the ground in the middle of all this? Is Fury still stretched thin after the Hellicarrier crashed?